Every now and then, a review product comes up that takes me by surprise and becomes one of my favorites. English on a Roll is a product like that. It arrived and filled a need that I didn't even know I had at the time. I knew Mr. B needed a good English grammar program, but I was at a loss as to what to choose. When the English Grammar Teaching Method set arrived, I knew it was going to be the perfect fit for us. 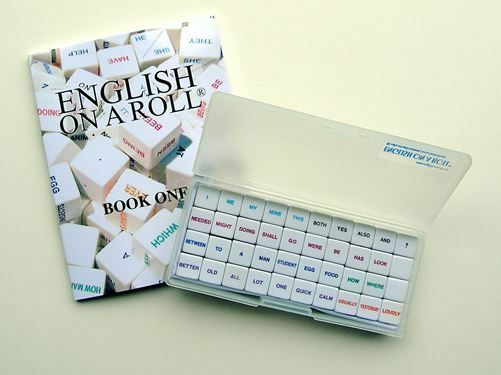 English on a Roll is a fun, multi-sensory approach to teaching English Grammar and syntax. The main component is the set of 40 cubes, or dice as I call them. You roll them like you would dice. then there's the book that has teaching tips, games, instructions, and reproducible to use along side the dice. Basically, this has the fun aspect Mr. B wants-the dice. And it has the pen and paper quality I like-the reproducible pages. It surprised me, because I didn't expect the book to be what it is. I was thinking it was just a book of "how to use these dice" and that's that. I wasn't expecting a book that is arranged around 37 lessons, each with their own worksheet for reinforcement. That's exactly what this book is. The layout is great. I really don't like books that have all of the teacher tips and "how to use this book" stuff in the front, followed by a set of worksheet pages. That's just too bundled for my ADHD mind to focus on. English on a Roll is arranged lesson by lesson. Mr. B really caught on to this program fairly quickly. Having the dice color coded with the varying parts different colors REALLY helped him. Seeing Blue pronouns and dark blue nouns helped to link them, yet differentiate them. Also, having everything for one pattern on one die really simplified things down for him, and caused him less frustration anxiety. The blank die is great to fill in with your own word. They've included some labels you can use, and if you need more they are just a standard size you can pick up at any office store. You can use colored pencils or ink to make the words color coded to match. For this review, I've used a graphics art program to put the word "love" on the die so you can read it easier. The worksheet pages are not busy or distracting, featuring just black and white text. However, the font used is a larger scale than most workbooks, and they make use of bold face type which causes the activities to stand out in an easy to see way. Lesson 2 "Be Verb" was probably his hardest. He just has a hard time linking is, am, are, was, were, and has been all to the word "Be." I loved the idea of drawing a tree, placing "Be" in the branches, and the words below. That really helped to illustrate it to him, along with the dice used. The lessons are short, but cover a lot of ground. The Dice are easy to use and easy to spread among other subjects. We were able to use the dice for writing to help him choose better words, for example. We also had fun using the dice to play silly paragraph games. I really like the included workbook/manual, and I appreciate the layout and arrangement of the lessons. Hidden Gem: We are able to play the conversation games as part of our in home speech therapy. We can play these games to work on generalizations, creative thinking, and overall communication. I love a product that can offer so much! Please click below to see what others from The Homeschool Review Crew had to say!